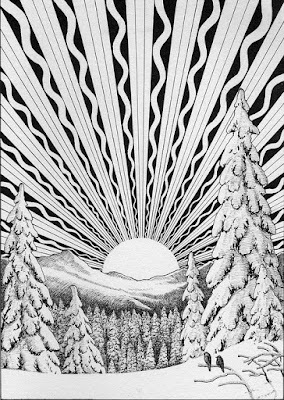 Winter is my favorite time of year, especially after the New Year begins. It is a calm, peaceful time for me to regroup and re-energize. But I’ve barely had a time to sit back and the first signs of spring are already rushing ahead. 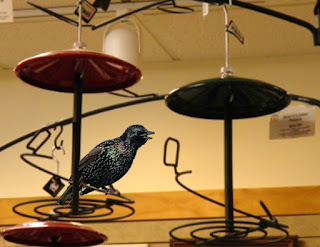 Today we had starlings in the ceiling of the Wild Birds Unlimited store in East Lansing scoping out nesting sites. Squabbles and squawks about territory were going on early in the morning up where the air vent leads into building. They usually just fly in and out but we had one venture further to the ceiling tiles above the front of the store. Dolly was sound asleep until, “tick, tick, tick”, the pitter patter of teeny feet crossed overhead. I cracked a panel open and the curious bird flew down to investigate. I was waiting with the camera to snap a photo of the exciting time. Two swoops through the store and I picked up Dolly, propped open the door and let him fly free. Males select the nest site and then females choose a male with the best site. Resident males start checking out nest sites in winter until March. Starlings will nest in just about any cavity, but prefer holes in buildings (barns and open warehouses, signs, and in soffits) and in birdhouses and woodpecker holes or natural cavities in trees. As many of you have noticed, the North American population of robins overwintering in Michigan is increasing each year. 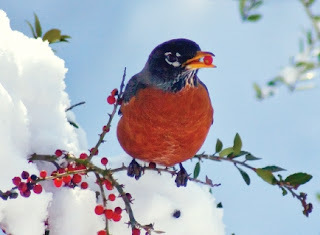 When robins are in their winter flocks they concentrate on berry bushes and fruit and nut trees. I always see them eating from my crab apple, Mountain Ash, and flowering pear trees, as well as under my feeders looking for peanuts and pecans. If you want to supplement his diet you can put out a tray of apple slices, suet, suet nuggets, mealworms, or nuts. And don’t forget the water. 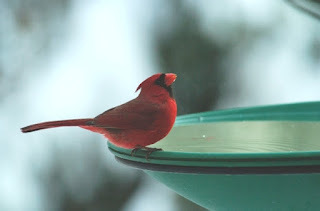 Birds need to drink and bathe too, even in cold weather. Dirty feathers lose much of their insulating properties, so a clean bird is a warm bird. A heated birdbath on cold days or a fresh bowl of water on warmer days is a big help. 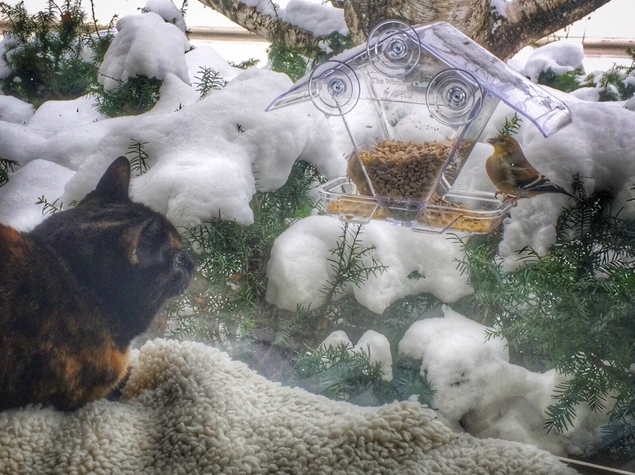 Snow brings many birds to the feeders, even the less common feeder birds. Northern Flickers don’t make a habit of visiting bird feeders, but bad weather draws them in to search for an easy meal of suet or nuts and a visit to the bird bath. 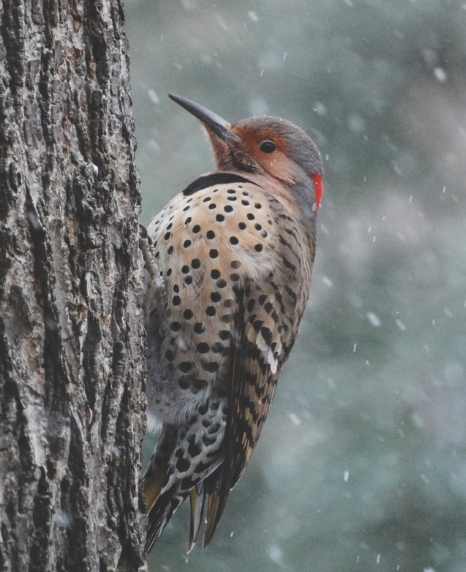 In Michigan, the snow prevents flickers from their favored means of ground foraging. A flicker’s tongue is smoother and sticker than other woodpecker species. It is shaped less like a harpoon and more like a brush to sweep up one of their preferred foods, ants. But they still have a long, hard bill to chisel out ant colonies or beetles hiding in bark. New Year resolutions are for the birds! I heard that the No Mess Blend of bird seed has been nuked in some way so that the seeds will not sprout when they land on the ground. Is this true? Our No-Mess Blends include a mix of seeds which appeal to a variety of birds that have had their shells and hulls removed. No shells. No mess. 100% edible! Most seeds are protected by shells or hulls. De-hulled sunflower kernels have been mechanically processed to remove the hull. Once hulled (taken out of the shell) a high percentage of broken seeds usually results in their inability to sprout. 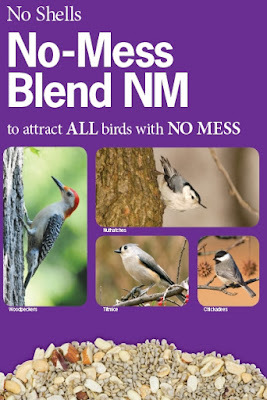 So Wild Birds Unlimited No-mess blends are not nuked but naked. her warm colors are still beautiful. Though food is scarce in winter, dehydration can be the biggest threat to birds. 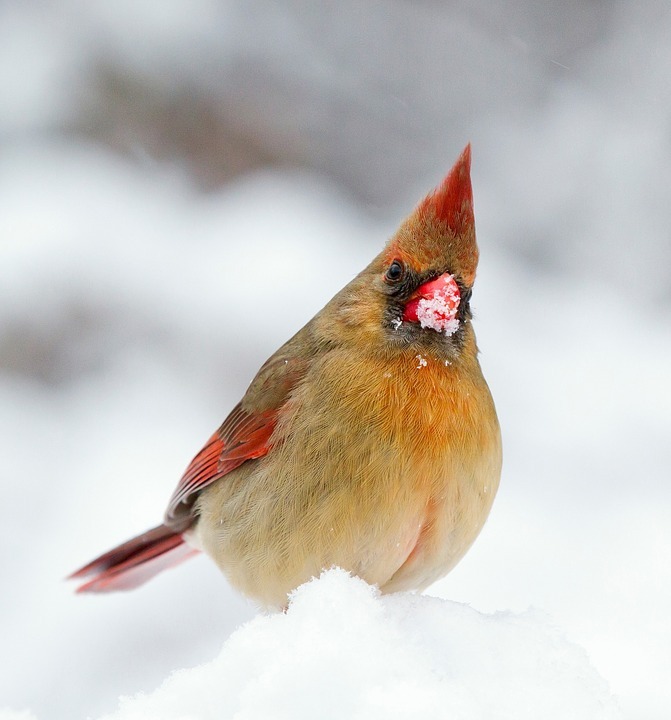 While birds can eat snow, it takes much more energy for for them to warm it to body temperature than it does for them to drink unfrozen water. One of the joys of the season is the opportunity to say thank you. and prosperous, healthy New Year. Do you hear the reindeer? No peeping Dolly! The distinctive plaintive call of the mourning dove primarily suggests gloom and sorrow. Yet throughout history, the mourning dove has been portrayed as a positive symbol. Beyond their sorrowful song is a message of life, hope, renewal and peace. While you are enjoying the many tasty treats that abound this holiday season, don't forget to share some goodies with the birds. Decorating a tree for our feathered friends and other wildlife is an activity the whole family can enjoy. Here are some fun and easy recipes f or making treats for the birds. •WBU Choice Plus Blend, which has suet nuggets, cranberries, cherries, nuts and sunflower seed. Mix peanut butter, seed blend together. 3.Hang with string or ribbon from a tree. 1.Split bagels in half and harden overnight. 2.Spread Suet Stuffing on each side. 3.Tie a string through the hole, and hang from a tree. The red cardinal is easy to spot in a snowy landscape and is often associated with Christmas and the winter season. 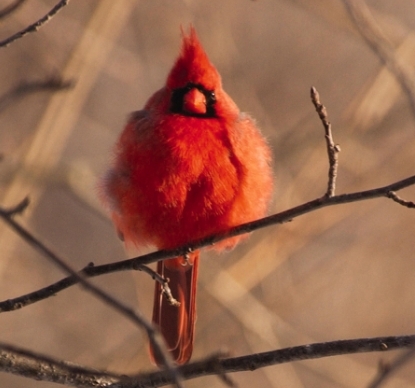 The Cardinals stay in Michigan year-round and don’t migrate. Older previously mated pairs will join flocks of about four to twenty birds. Except for a black mask and throat, the male cardinals are a cheery red all over including their bill. The red robes of church bishops, red holly berries, Saint Nicholas's crimson suit, the beloved red poinsettia, and red amaryllis also bring this bright color into the season as a symbol of life: This year is dying, but another is soon to be born. 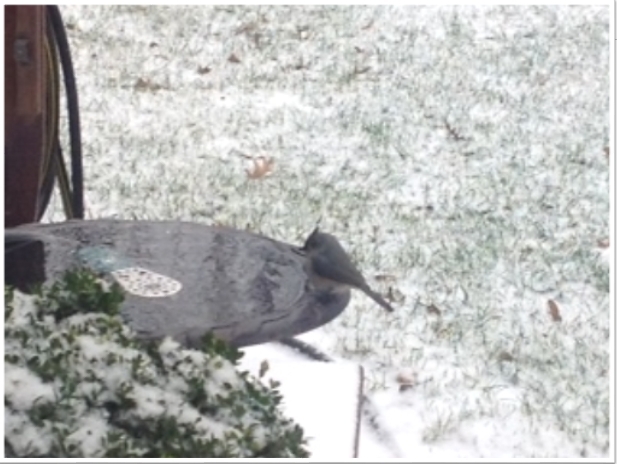 I have an towhee under my feeder. Is that unusual for him to be here in the Michigan winter? "Drink your tea!" That is the classic Eastern Towhee song, given by males. Male Eastern towhees have a black hood, back, wings and tail. The breast and belly are white and the sides are roufus. The female is similar, except she is brown where the male is black. 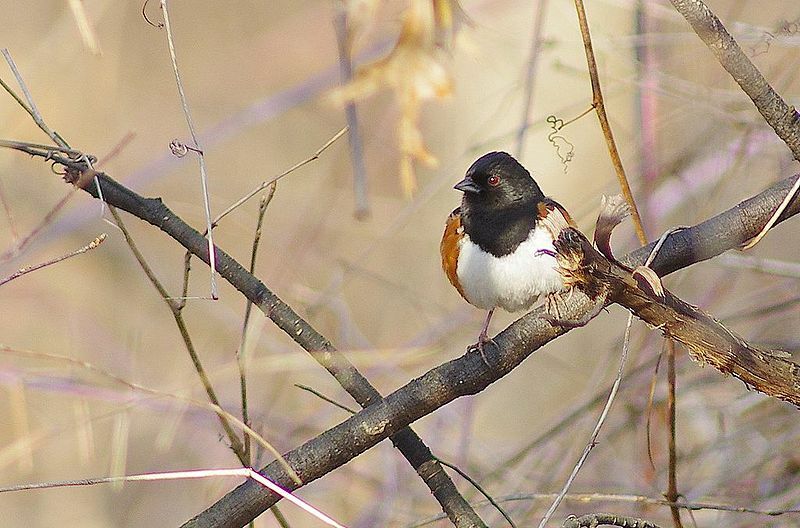 Towhees that nest in Michigan or Canada usually migrate to the southern United States for the winter. It is uncommon for one to stick around in the winter but don't worry. 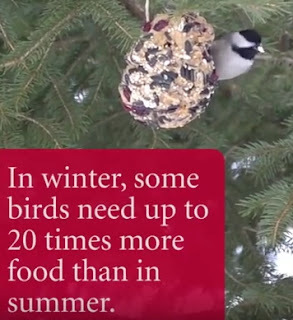 As long as there is food, water and a nice bush for them to roost they should be OK.
You Can help your Birds Survive the Cold Weather! 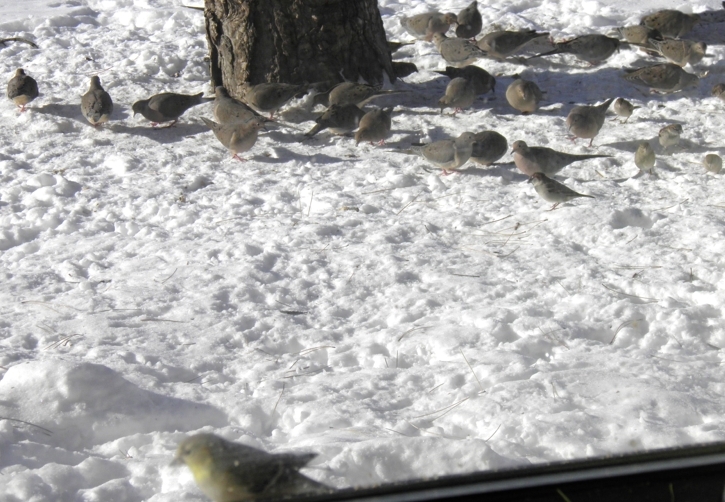 Photo Share: Birds Hungry today! 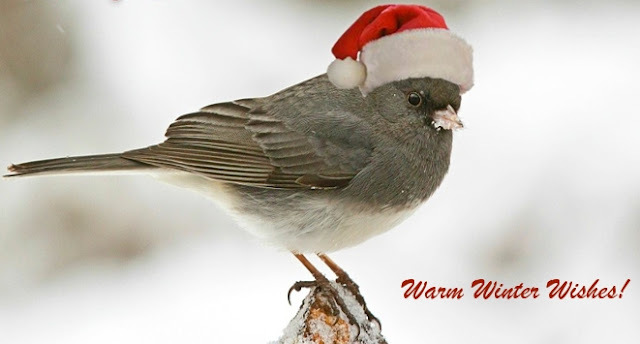 Low temperatures force birds to burn up to 10% of their body weight in stored fat each night to stay warm and this fat must be replaced every day. 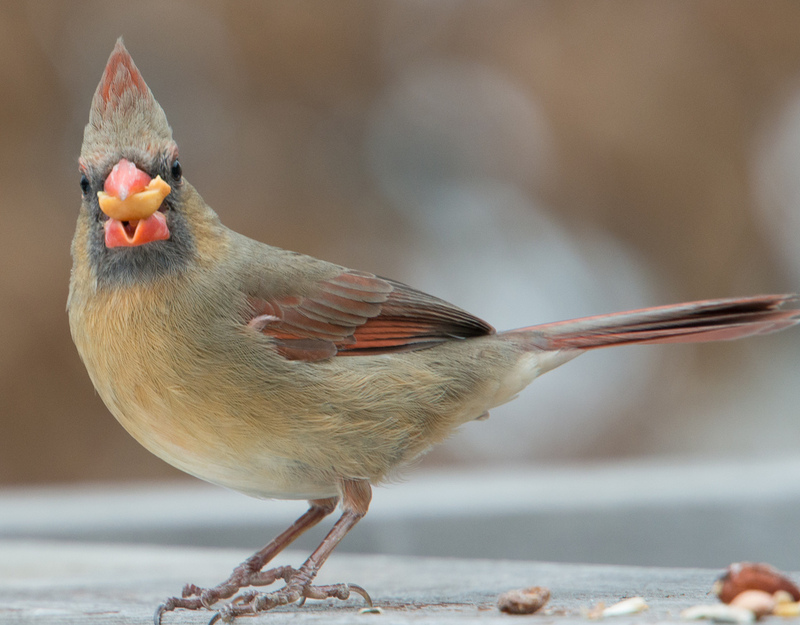 Be sure to keep your feeders filled with the high-energy, high-fat foods that provide your birds with the crucial nutrition they need to survive. Studies indicate that sunflower seeds, nuts, White Proso Millet, Safflower, and Nyjer® Thistle are among the most preferred seed types. Suet & Seed Cylinders also offer an easy way to provide birds with essential calories throughout the year. Photo Share: Caught in the act! 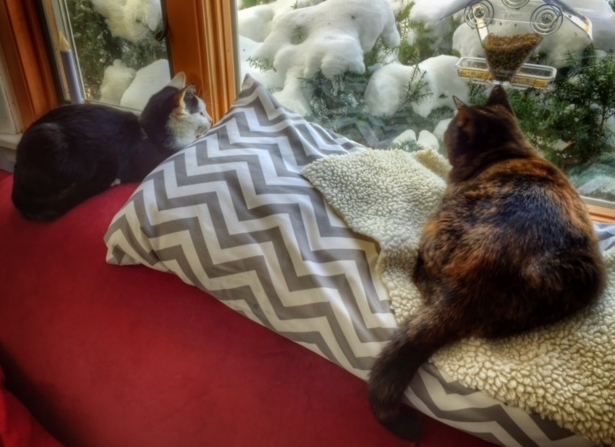 A lot of new bird watchers are asking me what birds they might see at the bird feeders. 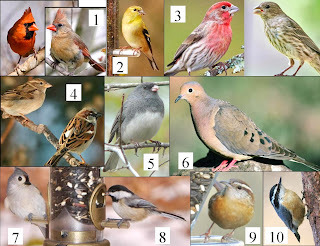 I’ve listed some of the most common winter birds you’ll see in mid-Michigan and the food they like at feeders. 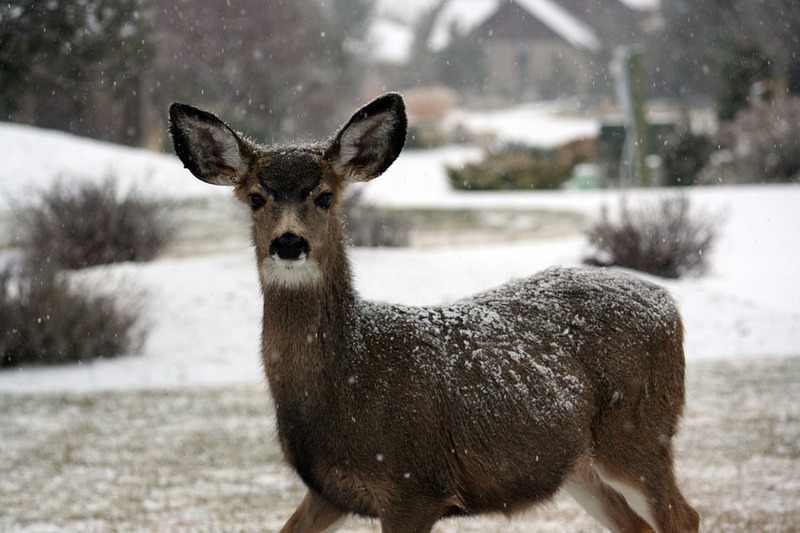 White-tailed deer are found from southern Canada to South America. Male deer, called bucks, are easily recognizable in the summer and fall by their antlers, which are grown annually and fall off in the winter. Female deer, called does, will go into heat for a 24 hour period usually in November in the northern portions of their range. The entire mating season lasts from October to December. They give birth to one to three young at a time, usually in May or June after a gestation period of seven months. Young deer, called fawns, wear a reddish-brown coat with white spots that helps them blend in with the forest. WOW! The Open House on Saturday was Crazy! At last year’s party we had 50 people and this year we had 50 people before the party even began. Did I expect such a large turnout? Obviously not. I quickly called in my Mom for help. She rushed over with a table full of unbelievably lovely goodies and also helped me keep restocking the seed bags. My brother soon followed to help with customers' questions and hunting for seed cylinders. Because we are a small business and because we pride ourselves in having the freshest birdseed in town, full of the nutrition the birds need to survive the cold weather, I only order enough food that I anticipate I need for a week. That way nothing is stale. Unfortunately we ran out of many things. Fortunately, another load of seed will be delivered Tuesday and even more seed and cylinders on Friday. I think the secret is out about how convenient seed cylinders are to feed a variety of birds. The number of cylinders we order has doubled since last year. People that shop at Wild Birds Unlimited regularly have to be the nicest group around! I want to thank everyone for making the day a HUGE success! You couldn’t have been more patient with me at the cash register. I kept going as fast as I could to keep the long line moving. 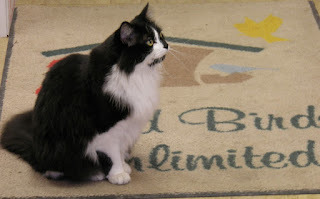 Thank you very much for your continued support of the Wild Birds Unlimited East Lansing shop. 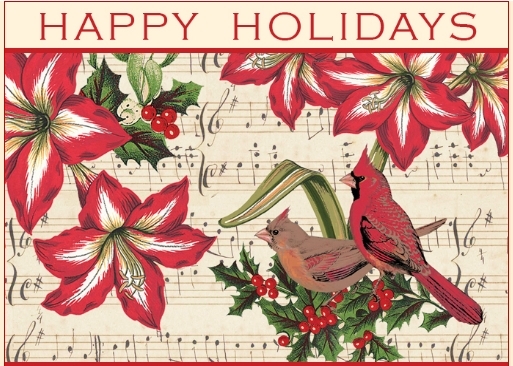 I wish you every Happiness this Holiday Season and throughout the coming New Year! I'm just a backyard bird admirer and not overly knowledgeable about habits, but in the middle of the snowfall, we just had a female redwing blackbird at our suet feeder in Southeastern Michigan. Isn't that a rarity this time of year? While not common, Red-winged Blackbirds have been known to make appearances in Michigan during the wintertime. Blackbirds usually leave Michigan soon after nesting season is over but they don't have to. Most fly to the southern and central states in huge male or female flocks, where they are abundant especially on farms. Young males also stick around sometimes so they will be the first ones back to claim a nesting territory in late Feb or early March. Is there a benefit for the birds to have sunflower seeds without the shell? Very good question! 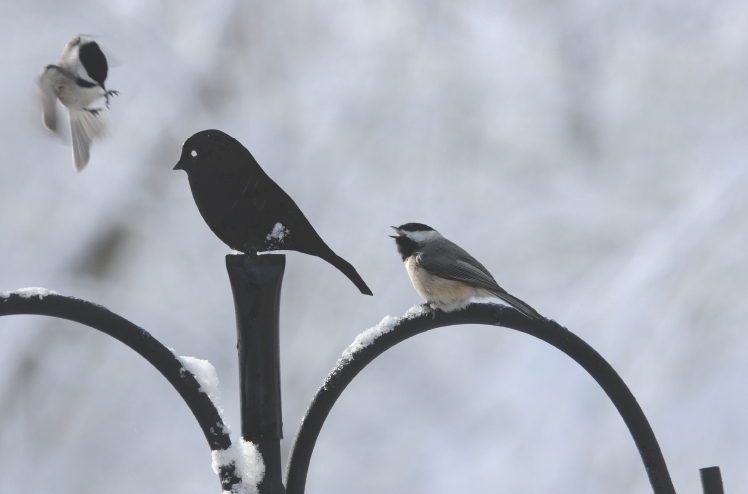 Birds will come any feeders with the high-energy, high-fat foods that provide them with the crucial nutrition to survive. Whether it has a shell on it shouldn't effect the number or variety of birds that frequent a feeder. The most obvious benefit of shell free bird foods is that the birds are able to eat the food faster and then move to a safe location to digest. Predators won’t have that extra few seconds of distraction while they crack the seed to pounce. There is about twice as much seed in a bag without shells because you aren’t buying the shells. This means it should last twice as long in the feeder. And because no waste birdseed has no hulls, the seeds don’t sprout weeds under the birdfeeders. With less mess, rodents won't be attracted to the area. What are no-mess seed blends? A good no-mess blend may also contain nuts or hulled millet; beware blends which promise a "waste-free" experience but contain filler ingredients such as cracked corn, canary seed, or wheat. While these ingredients may not have a shell, they appeal to a very limited group of birds and will often be rejected by the species commonly found in our yards. Which no-mess seed should I use? Both of the no-mess blends we offer have sunflower seeds and peanut pieces without the shell as the first ingredients. Sunflower for all the seed eating birds like finches and peanuts to attract all the bug eating birds like chickadees. Peanuts have a high calorie/ounce ratio due to its high fat and protein content to attract a variety of interesting birds. Our #1 selling Wild Birds Unlimited No-mess LM has a Little Millet (LM) added to attract all the ground feeding birds like the juncos, sparrows, and doves. The hull is removed from the white proso millet so it can’t grow. It is 100% edible. 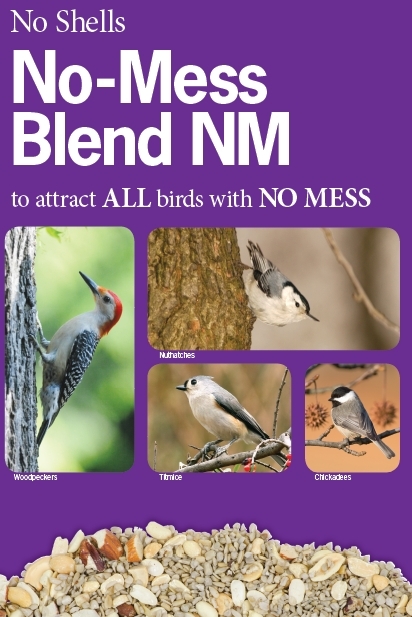 Our Wild Birds Unlimited No-mess NM has a chopped- up Nutty Mix (NM) added to attract more of the forest birds to the feeder. The Tree nuts include, but are not limited to, pecan, walnut, almond, hazelnut, cashew, pistachio, and Brazil nuts. Birds that would head for the peanuts and tree nuts are chickadees, woodpeckers, nuthatches, jays, wrens, robins, bluebirds, warblers and more. I would recommend both blends highly! We sell at least a couple of tons a week. 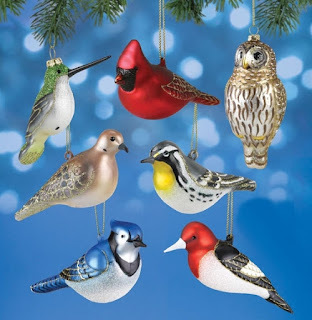 Birds are considered a universal symbol of happiness and joy and are regarded by many to be a necessity on the Christmas tree. Because bird ornaments were difficult to create, few glassblowing families in Germany specialized in the making of these special pieces. 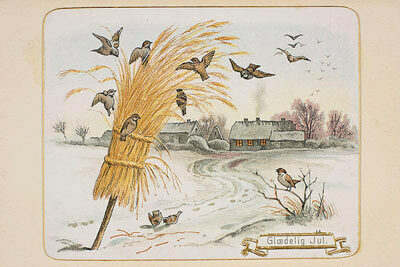 Birds represent messengers of love and are the harbingers of good things to come. Wild Birds Unlimited East Lansing store has a selection of hand-blown glass bird ornaments designed by Margaret Cobane, a Nationally recognized Michigan artist. She says, " My fascination with Christmas, nature, gardening and Santa is a recurring subject in much of my work. I especially like Santa because he is such a good, kind soul. I believe he is a symbol of goodness and generosity. My designs are created from my love of the season and all of the traditions that are dear to our hearts." This year’s mild fall and the improvement of outdoor decorative lights has made the sparkly trip home almost too distracting. However on these dark days, I’m talking literally dark with December having the least amount of daylight, the bright lights can feel promising. The custom of Christmas Lights goes back to the use of candles decorating the Christmas trees in early modern Germany. 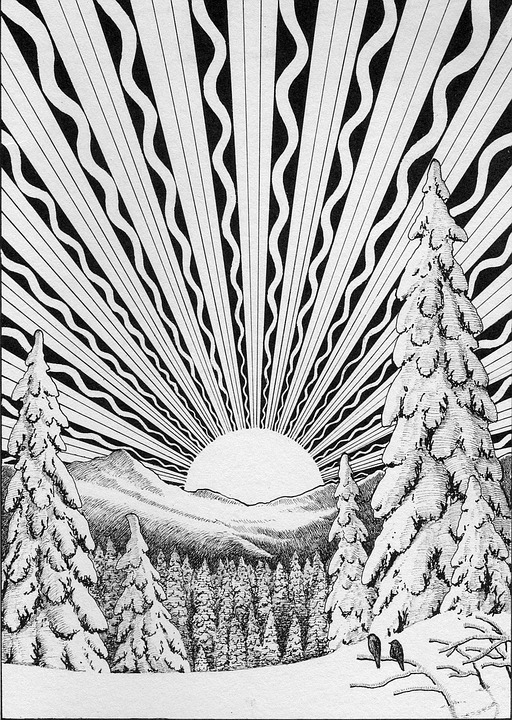 The idea of using lights is blend of the traditions from the people that celebrated Winter solstice by lighting candles to encourage the light to return after the cold, dark winter and the Christmas tradition of lights representing the Star of Bethlehem. Thomas Edison brought us the first electric Christmas light display in 1880. 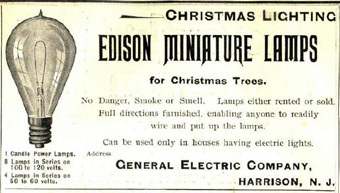 In 1900, the first known advertisement for Christmas tree lights appeared in Scientific American Magazine. 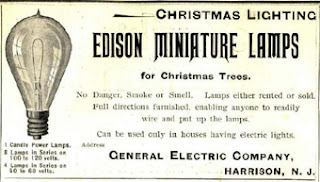 Decorating outdoor trees with electric lights became popular in the early 20th century followed by, strings of electric lights along streets and on buildings by the mid-20th century. 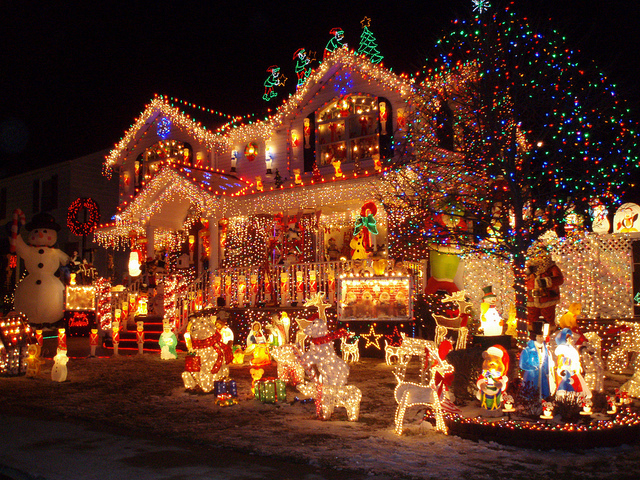 In the United States, it became popular tradition to outline private homes with lights beginning in the 1960s. 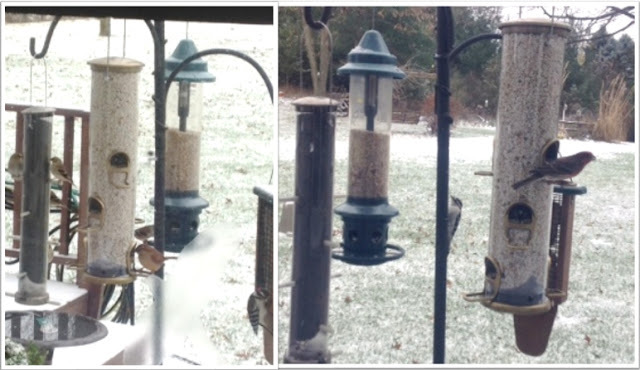 Did you notice an increase at the feeders before the snow fall? Our Michigan birds are equipped to withstand most winter weather. 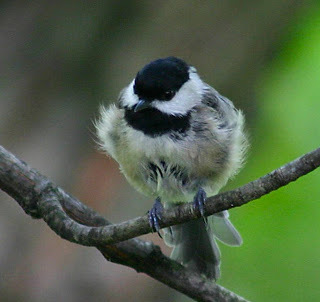 They preen and adjust their feathers to create air pockets that will help them keep warm. And eat high-energy, high-fat foods to stoke their internal furnace. At about 6 inches, the Downy Woodpecker is the smallest woodpecker in North America and the most frequent visitor to backyard feeders year-round. They like to eat peanuts, suet, mealworms, sunflower and safflower seeds. Downys have a white belly and back and their black wings have white bars. Only the males have a red patch on the back of the head. And they are called downy because of the soft white feathers on their back. 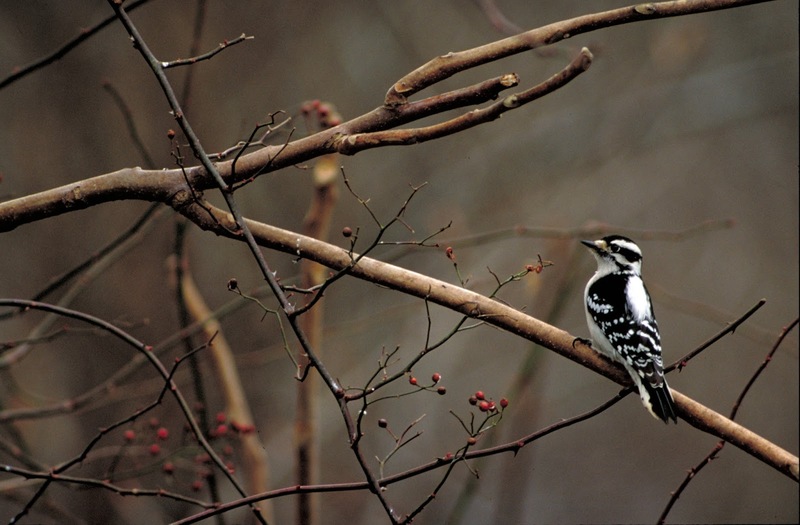 Downy woodpeckers are confused commonly with Hairy woodpecker, their larger cousins, which have similar plumage, but are around 9 inches. They use vocalizations and body signals to communicate. They produce a variety of sounds, including "pik", rattle, scolding, "wad", "chirp", squeak, screech, and distress calls. The "pik" call introduces the rattle call, and these are used during aggressive interactions. 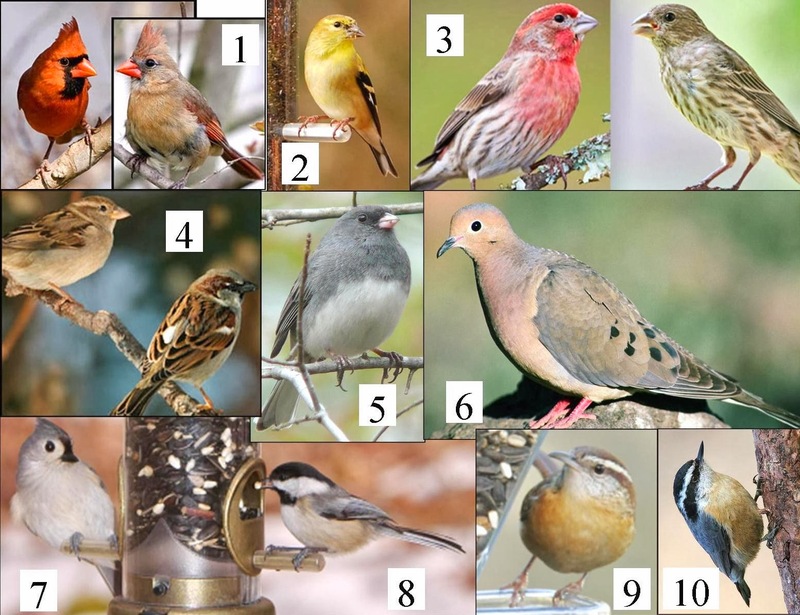 Short calls, the "wad" and "chirp", are uttered by young birds. 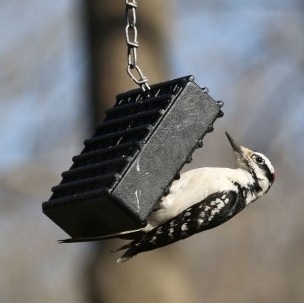 A longer note call, the squeak, is also uttered by young downy woodpeckers. The screech and distress calls are used to signal alarm. The Northern Raccoon (Procyon lotor) is known for its distinctive black mask and night time raids on bird feeders. 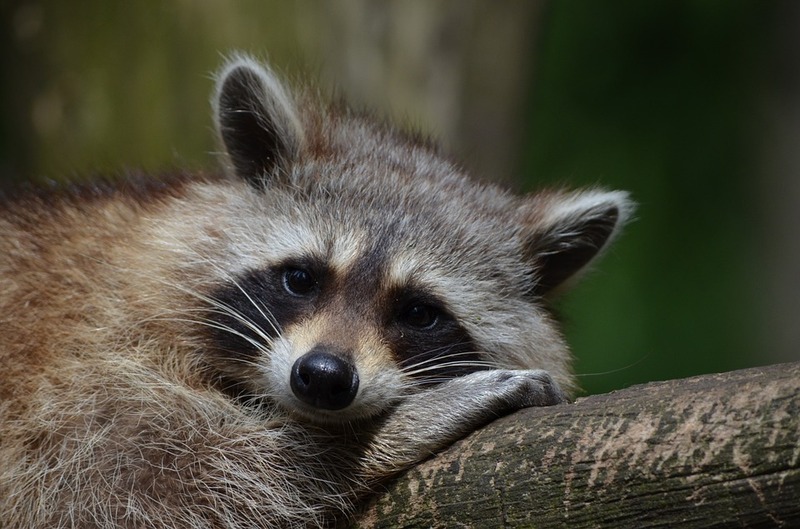 While raccoons don’t hibernate, those that live in cold climates like Michigan, can hole up in their burrow or under decks for weeks at a time. During their long periods of sleep, raccoons do not eat. Without food, they can lose up to one-half of their total weight! To prepare for these difficult times, raccoons have to bulk up in late summer and fall to survive cold winters. When they are awake they are always savaging. The territory of a raccoon can be as large as ten miles. This means he'll usually stay in your yard for a little while and then move on looking for different food, water, and shelter. Of course another one may replace the one that just left your yard or you may be free of raccoons for weeks. 1. Bring feeders in at night- most raccoons and skunks forage at night and if the feeders are put away they will move on faster. 2. Use squirrel proof feeders- The Squirrel Buster Plus feeder deters squirrels, raccoons and large black birds. You can adjust the tension on the spring mechanism to have the feeder ports shut when unwanted guest attempt to feed. 3. 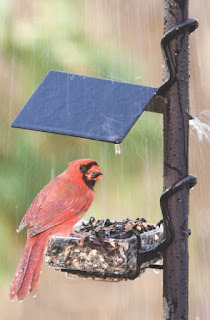 Food Choice- Use a birdseed blend that has seeds that the birds in our area like to eat. Some cheaper blends are filled with milo and oats that are just kicked to the ground and left for the rodents to clean up. All of the Wild Birds Unlimited blends are formulated specifically to attract the widest variety of birds in mid-Michigan. Pure Beef Suet with no seeds or Hot Pepper suet deters most animals but still attracts a wide variety of woodpeckers, chickadees, nuthatches, titmice, and wrens. Safflower seed: You can start by offering safflower gradually, mixing it with the seed you currently use. Over time increase the amount of safflower until you are feeding straight safflower. 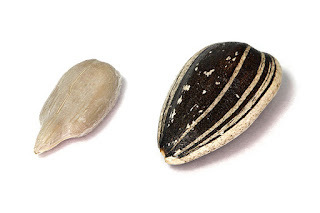 The seed looks and tastes different from other bird seed, so it may take your birds some time to adjust. Safflower is a small, white seed that is high in protein and fat. Many favorite backyard birds - including cardinals, chickadees, finches, doves, woodpeckers, titmice and nuthatches- savor safflower. Blackbirds, starlings, raccoons and most squirrels typically refuse to eat safflower seed. 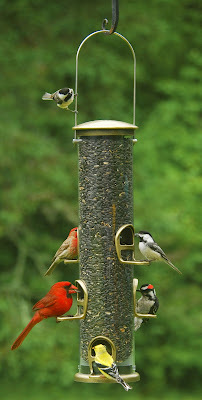 Safflower seed cakes and seed cylinders are also available at Wild Birds Unlimited - East Lansing, MI. Nyjer Seed – Nyjer, niger, and thistle are all common names used to identify a tiny black birdseed cultivated in Asia and Africa that is high in calories and oil content, and loved by American Goldfinches and avoided by most raccoons and squirrels. 4. Baffle Feeding station- The long, cylindrical design of our Raccoon Baffle specializes in deterring raccoons as well as chipmunks and squirrels from reaching your feeders. This baffle can be mounted to fit our Advanced Pole System® (APS). If you don't have an APS setup why not? The Basic APS Boxed Setup is an excellent way to get your bird feeding hobby organized. But we also have special wrap around baffles that can go around skinny poles too. Which one is the true character? This Carolina Wren poses before he attacks the sunflower and nuts in the cylinder. 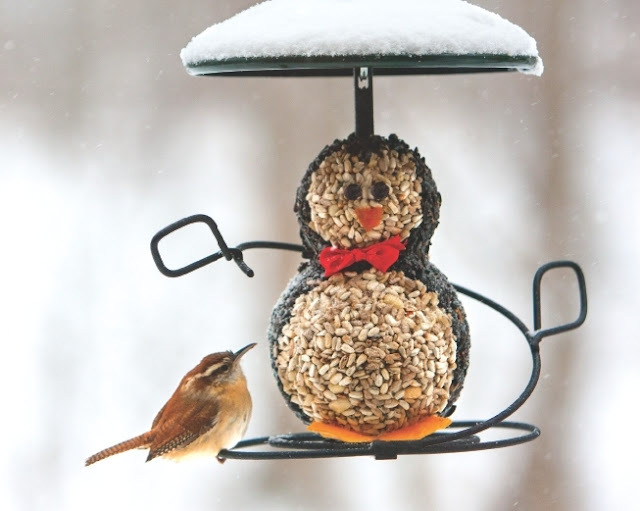 Available for a short time only at Wild Birds Unlimited, Preston the seed character attracts a variety of birds. Built by the same people that developed our innovative Advanced Pole System (APS), The Beast is a new indestructible suet feeder! Dan Panetti, the owner of the Mequon, Wisconsin Wild Birds Unlimited store introduced us to The Beast a few months ago. He actually gave one to my brother to test locally. It weighs over 2 pounds - more than twice the weight of an average gray squirrel! The S hook on The Beast chain fits snugly on our poles making it very difficult for a critter to remove - in the video, you see it simply hanging on APS on my deck - a raccoon has never removed it! A semi permanent method for hanging on a tree branch is already figured out - essentially it makes the feeder one with the tree until you choose to take it down and refill - a raccoon absolutely cannot remove it! I put the feeder up in a "hot" spot for squirrel activity and used a peanut butter suet. Within a day, there was a squirrel investigating. He stayed on the feeder for quite some time while I watched and seemed to be eating something. Later when I checked the feeder, there was a very small amount of suet taken along the edges. A couple days later I again saw him on the feeder for a shorter time but he did not seem to get enough to satisfy him and I haven't seen any other squirrels on that feeder again. 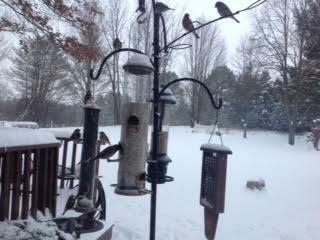 There is a lot of bird activity on the feeder though and the cake is lasting longer without squirrels feeding. I think the feeder will work very well as a squirrel proof suet option that is readily accepted by my suet eating birds of all sorts. 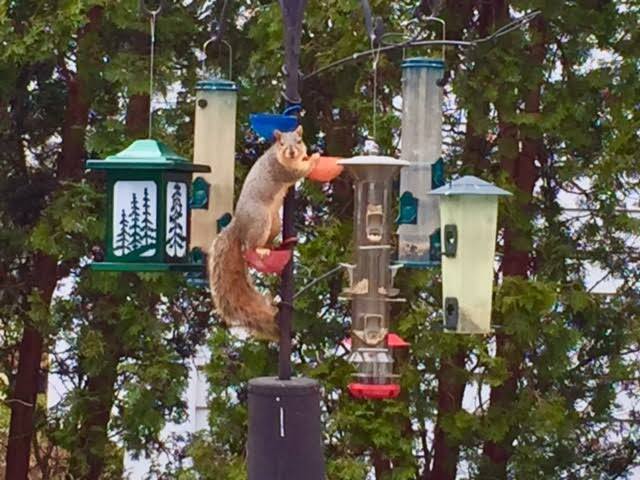 The manufacturer describes the feeder as Squirrel Proof- Aggressively Tested against red, gray, fox, and flying squirrels. Raccoon Proof- In both cases use as directed. Extremely difficult for House Sparrows to use. Watch Dan Panetti's video at: https://youtu.be/The-Beast! 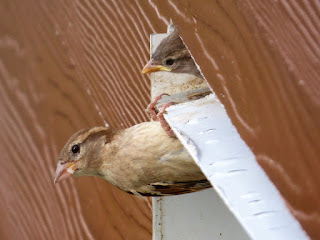 We have a garage that the sparrows were nesting in and now they seem to want to continue to live there. Is there anything you can do to dissuade them? House Sparrows like to nest and roost in any niche. While humans are very good at clear-cutting any natural bushy bush where birds like to hang out we are also very handy at creating several good unnatural spots for sparrows to squeeze into near our houses. Wild Birds Unlimited has shiny scatter tape to scare birds away or you could purchase a couple mylar balloons to float in the garage to encourage them to find a new domain. The best way to make everyone happy is make your garage less appealing while also providing them an appropriate bird house in which to live. In the winter birds often seek protected places to roost or sleep. Dense vegetation found in thickets or the interior branches of evergreens serve as a windbreak and conceal the birds from night-prowling predators. 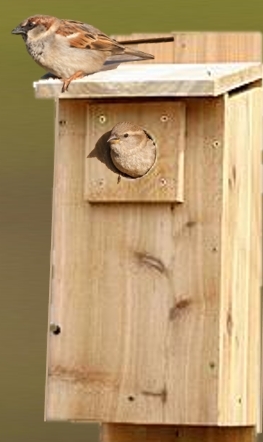 Some cavity nesting birds like House Sparrows, bluebirds, chickadees, titmice and some woodpeckers will also roost together in nestboxes (birdhouses) in the winter. And Screech owls and squirrels are some other box-nesting species that like to stay warm in boxes. The Wild Birds Unlimited Advanced Pole System® (APS) EZ-Attach SideDish™ Bird Feeder allows you to offer a variety of foods, whether it's mealworms, seed blends, fruit or our always popular Suet Snacks. 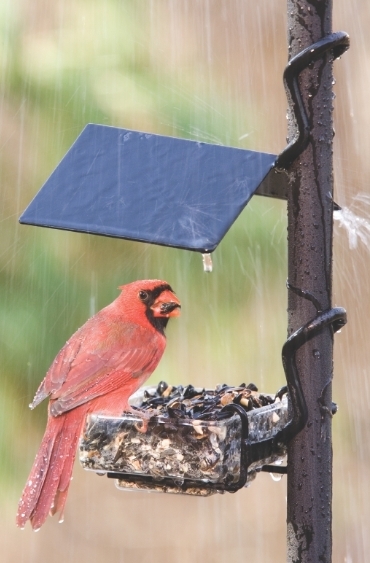 This little tray is a versatile feeder that allows you to cater to many birds' tastes. And thanks to our EZ-Attach design, adding this feeder to your pole setup is a snap. Just slip the EZ-Attach unit on an extension pole and pull down. You can also add an On-Guard roof to protect the food.